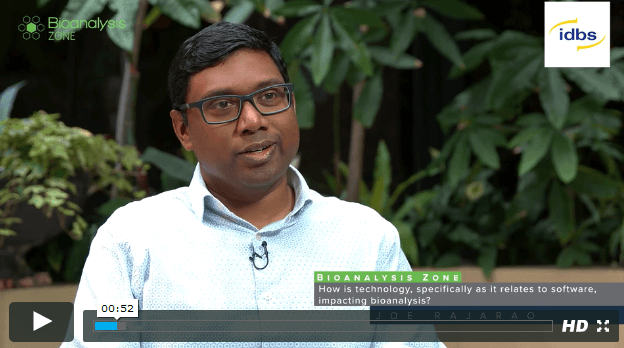 What is The IDBS Bioanalysis Solution? The IDBS Bioanalysis Solution is a study management and method execution platform that combines electronic data capture with structured workflows that drive standard bioanalytical processes. Workflows are configured for study definition, sample preparation, data acquisition and analysis, and auditing. Based on best practices defined with the world’s leading pharmaceutical, biotech and CROs, the IDBS Bioanalysis Solution delivers a pre-configured solution specifically developed for both small and large molecule methods. These workflows are deployed within bioanalytical labs at biopharmaceutical companies and CROs across the globe. Bioanalytical CROs are working in an increasingly competitive landscape and are frequently being held back by a crowded and siloed set of systems and processes. From part electronic to part paper-based workflows, to standalone point-solutions, the result is a lack of insight into data and slower reporting and results handling. Whether you work with small or large molecules; in a regulated or non-regulated environment; or whether you’re a pharmaceutical or biotechnology company or a CRO, the IDBS Bioanalysis Solution delivers results that impact your bottom-line. The integrity of your bioanalytical process and data will determine the quality of your bioanalytical study. With the right solution, the entire process can flow with seamless and comparatively worry-free assurance. With the primary impact on your study timeline occurring during the audit and review phase, bioanalytical labs and CROs need a solution that makes this simple, transparent and quick. 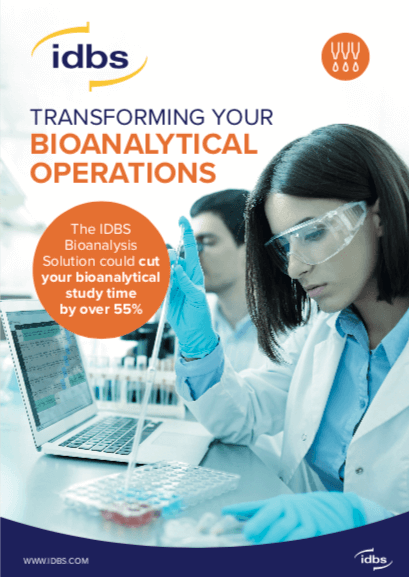 The IDBS Bioanalysis Solution reduces reporting cycles and can shrink your overall study times by half. Our solution can do this by reducing the QC stages and speeding up the compliance processes to ensure that all non-conformities are captured in real time – avoiding inconsistencies and costly reworks during the reporting stage. The solution provides traceability and genealogy to all standards, reagents and instruments used and integrates with industry standard applications such as LIMS like Watson. Using preconfigured workflows based on industry best practices, the IDBS Bioanalysis Solution can support common laboratory processes for both small and large molecules. You can shorten study duration by up to 60% by streamlining study review and QA audit, eliminating paper study binders and equipment logbooks and facilitating sample preparation by easing the documentation burden. Watch this short animated video about how The IDBS Bioanalysis Solution can help you. Every laboratory submitting BA data to a regulatory agency must comply with a number of guidelines. With all laboratories working differently, the regulatory reporting process can be hugely resource intensive. The IDBS Bioanalysis Solution can help save vast amounts of resource by collating data across multiple runs, eliminating the need for paper recording and reducing the need for error-prone manual data input. Validated templates provide secure links between the original data and any final calculations for ease of audit, with data recorded as securely as traditional paper records. The IDBS Bioanalysis Solution is geared towards improving compliance and reducing QC burden. Mandatory fields, acceptance criteria and direct transfer of data and values from balances and pH meters, ensure high-quality data is entered at the time of study execution. Our bioanalytical solution eliminates transcription errors by directly accepting raw data from a plate reader and performing statistical analysis and curve fitting within a workflow. QC of a study can move from manual checks of date or time stamps, cross-reference checks of metrology logs, expiration date checks for all materials used and revisiting calculation to an exception-based auditing methodology. The IDBS Bioanalysis Solution enables you to create and manage electronic methods to drive all aspects of sample analysis, including sample preparation, instrument set-up and post-run scientific review. Our bioanalytical solution can also consolidate run data from your LIMS and facilitate the compilation of study reports.  Along with on-premise and hybrid client options, the IDBS Bioanalysis Solution can be deployed in a controlled, fully validated GxP Cloud environment – providing security, eliminating paper, reducing total cost of ownership (TCO), and reducing time-to-value (TTV) for you.  The built-in audit log monitors data input and GxP settings can be adjusted to full compliance mode where authentication credentials are mandated at each step of the process – letting you get back to what you do best: science. 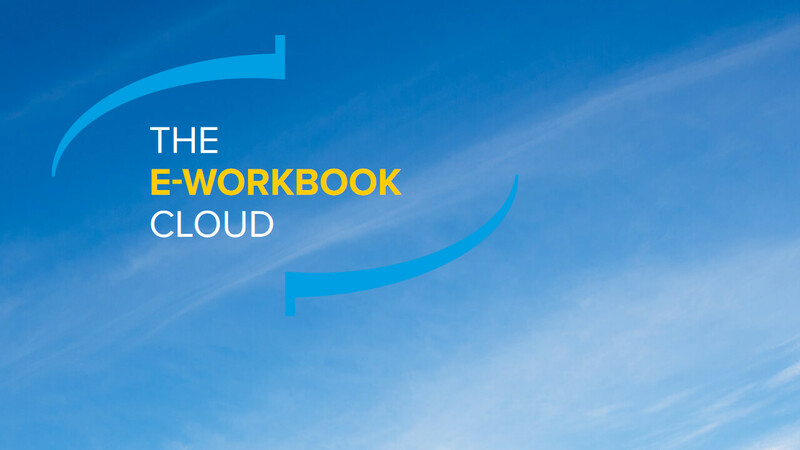 IDBS’ family of desktop and web-enabled software products are built on a cross-disciplinary electronic laboratory notebook (ELN). Our platform is proven to increase productivity for any organization engaged in research and development. Built on a set of bioanalytical workflows that incorporate best practices, the IDBS Bioanalysis Solution helps you go beyond creating a digital version of your paper records. It can revolutionize the way you run your bioanalytical operations. 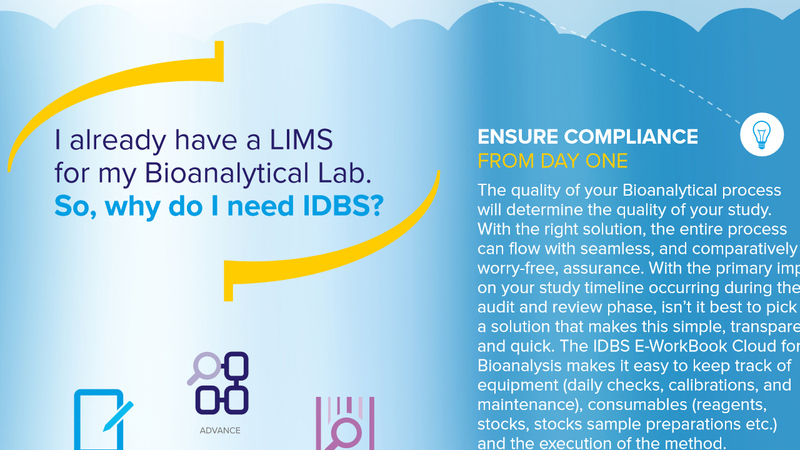 Sitting at the heart of your lab ecosystem, the IDBS Bioanalysis Solution can integrate with and ‘pull’ data from existing LIMS, balance instruments, metrology systems, ERP systems and document management systems. This single portal approach enables you to simplify the management of your bioanalysis operations, improving your project planning and scheduling capabilities. 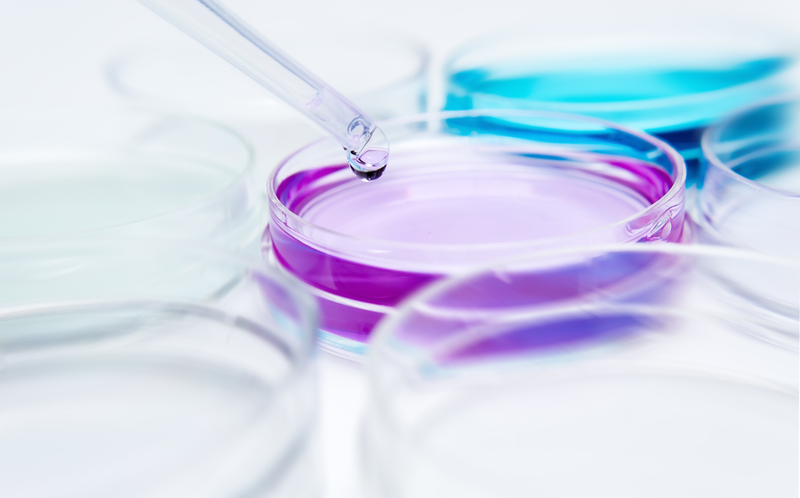 Labs that use industry standard bioanalytical LIMS, like Watson, can leverage tight integrations to ensure project and study hierarchy and attributes (project name, ID, analyte information, etc.) are automatically created and updated within our solution.  Sample lists and run information can be retrieved and stored for easier referencing at the bench, such as in a specified plate format. Finally, result data can be transferred from LIMS, or even the analytical instrument, to our spreadsheet for downstream calculations and reporting.  In this solution brief, contemplate your disparate systems and consider whether they could be replaced by a single platform.